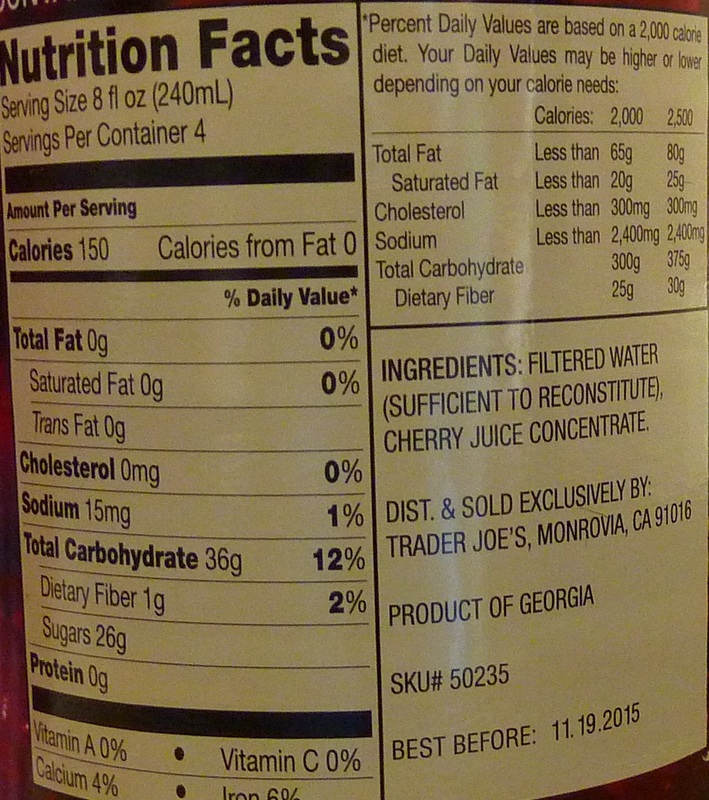 Not to be confused with Trader Joe's Cherry Cider, this beverage is, as the bottle claims, 100% cherry juice from concentrate. And while its "cider" cousin is much sweeter and more Juicy Juice-esque, this beverage isn't nearly as tart as I thought it might be. It is, however, the "adult" version of the Cherry Cider, and no, I don't mean that it's endorsed by Ron Jeremy or anything like that. I mean they both kinda taste like cherry, and they both contain nothing but 100% juice, but sugar-craving sweet-toothed children would probably enjoy the cider beverage more, thanks to the sweeter juices blended into that one. This 100% cherry drink is a great balance of tart and sweet. And no, I have never seen a Ron Jeremy film, with the exceptions of Boondock Saints and Ghostbusters, but I did see him in person once at the Jiffy Lube on La Brea and Melrose, and one of his friends used to speak at our old church a lot. No kidding. At first gulp, this beverage tastes just like a cherry Jolly Rancher. But the finish isn't quite as syrupy sweet. There's a slight aftertaste, but I usually detect some aftertaste after eating actual cherries, so I guess that's to be expected. Plus with the juice, you don't have to worry about spitting out pits. But at $4 for a quart, this stuff ain't cheap. I'm guessing it takes a whole lot of cherries to make a quart of juice, though. Sonia liked it too, maybe even a bit more than I did, but she doesn't think this will be a regular purchase in our household. It's too much money for too little juice, and honestly, I'd just as soon drink the Juicy Juice-ish stuff anyway. I love me some sweet beverages. And while this drink is definitely sweet, I'd say it's geared for grown-up palates only. Now we have Cherry Cider, Cherry Juice, and we're eagerly awaiting the unveiling of TJ's Cherrystone Clam Beverage. Just kidding. I'll give this juice 3.5 stars. Sonia sees my 3.5 and raises me half a star. You should try the 100% Tart Cherry Juice sometime - way more tart than even the "adult" version of the cherry juice. A little goes a long way with it, but it's delicious! I didn't know they offered Tart Cherry Juice, Tess. I'll look for it next time! Since cherry juice is the latest in the antioxidant craze, I think you are suppose to mix a small amount into other liquids or take it like you would cough syrup. Sort of like a supplement. That's true, if it's concentrate. But the juice that's "made from concentrate" has already been reconstituted. I'm taking tart cherry concentrate right now. It's quite delicious, though I'm not sure it's doing anything. People say it's helpful for all sorts of things though. Totally can be a great summer staple. Mix with sparkling (lime) water for a longer lasting and more enjoyable beverage, maybe a fresh lemon or lime and maybe some gin (or vodka). It's perfect. Trader Joe's is great, you just have to talk to a mother of six and see how they make ends meet. You can add agave syrup or sugar if you're a Juicy Juice fan. My children actually loved this juice! Love the blog, by the way.